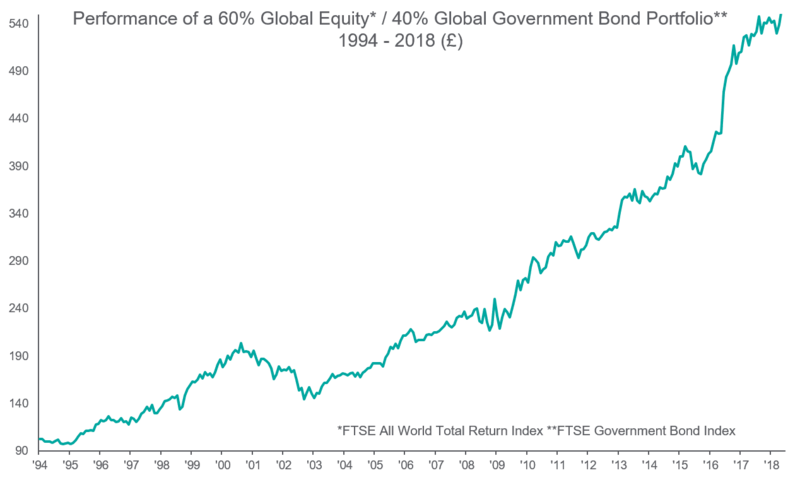 For most of the last four decades the price of traditional asset classes - equities, government bonds and corporate bonds - have been in an uptrend. There have been some very unpleasant times but if you have held onto your financial market assets you have been well rewarded. The idea that a balanced portfolio with 60% in equities and 40% in bonds could offer a good return with a reasonable level of risk was first put into practice in the 1950s and has been a stellar performer for those with the discipline to maintain it through thick and thin. The chart below shows the performance of a traditional 60/40 portfolio since 1994. This invests 60% of assets in global equities and 40% in global government bonds. Both the components are calculated in sterling. The result has been a return of 7% nominal, compounded, over those 25 years. UK CPI has averaged 2.0% in that time so the real return has been 5% per annum. During that period the financial services industry has offered us all ever more complex ways of accessing financial markets. Had we just done something that has been recommended for decades, we would have fared a lot better than the vast majority of those more complex products. We are still quite optimistic about the outlook for the 60% that is invested in global equities. We think global equities are reasonably valued against a backdrop of very strong corporate earnings growth. For example, the trailing price/earnings ratio for the MSCI World Index has been declining over the last two years as earnings growth has outpaced the price increase in the index. That is strongly indicative that there is little euphoria in the price. But the 40% could be challenged on an ongoing basis. Let’s use the gilt market as an example of how the outlook for bonds is much less attractive from a total return perspective than it has been for many years. The chart below shows the total return of the 10-year (and longer duration) gilt index since 2006. The chart highlights two periods in particular when returns were extremely strong. 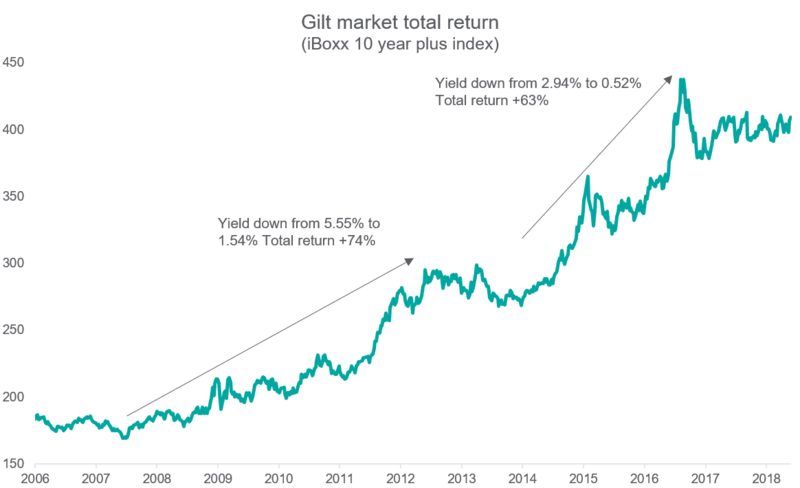 In the five years from mid-2007 to mid-2012 you made 74% as the 10-year gilt yield fell from 5.5% to 1.5%. Then from late 2013 to mid-2016 you made an even more stunning 63% in less than three years as the yield went from 3% to 0.5%. These are remarkable returns from doing nothing more than lending money to the British government. But today the 10-year gilt yield is 1.4%. From that starting yield it is extremely unlikely you will generate much of a return. For example, an increase of just 0.2% in the gilt yield over a year would mean that you would make no money owning that gilt for the year. 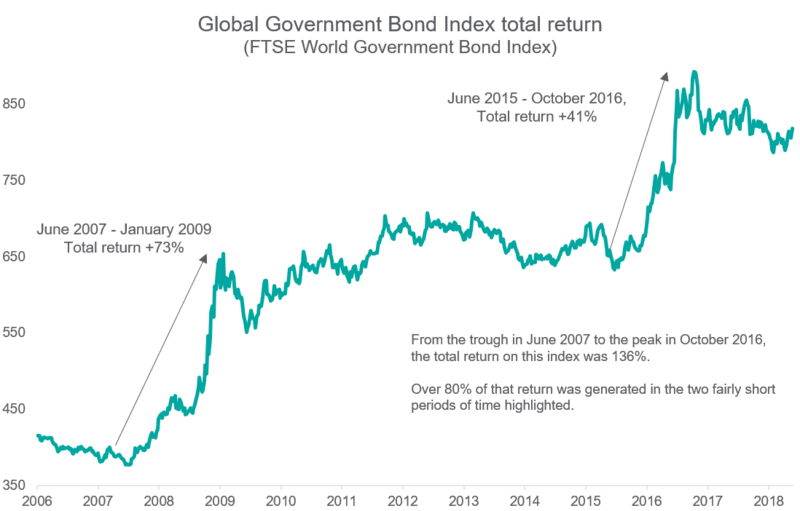 The return profile of the global government bond index has also been very strong but the return has come in two rather short periods, as illustrated in the chart below. The first was June 2007 to January 2009, the height of the financial crisis. The second from June 2015 to October 2016 when bond yields in Europe moved from 1% to -0.2%. This index is also affected by movements in sterling and both those periods encompass periods of considerable sterling weakness, the latter thanks to the Brexit referendum in June 2016. That weakness is helpful to the return of a global index as the overseas components show stronger total returns to a sterling based investor. What this suggests to us is that it will require another crisis to get significant returns from bonds. Bonds therefore deserve a place in a portfolio as a provider of diversification in extremis, but their return profile may be disappointing. You might say that is fine. I can live with the return from my bond portfolio being not as good as it has been. I own bonds because I think they provide diversification to my portfolio on an ongoing basis and that when there is a wobble in the equity market, I will get an offsetting positive return as bond yields decline. Unfortunately the relationship between the global equity and bond indices has not been much of a diversifier. A large part of the problem is the impact that sterling has on both series. In both indices, over 90% of the weightings are overseas so the moves in sterling, as discussed above, have a large impact on the total return. 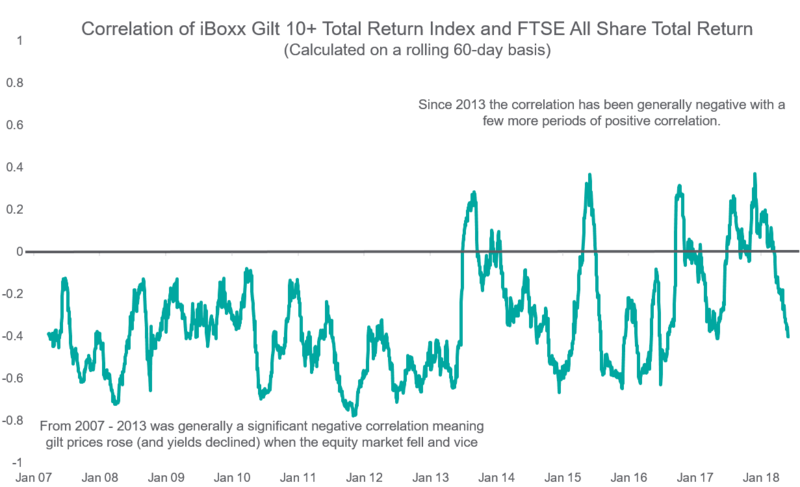 It is more instructive to look at bond and equity relationships without the currency effect so below we look at the relationship between the FTSE All-Share and the iBoxx 10 year plus Gilt Index. Between 2007 and 2013 the correlation between UK equities and gilts was always negative. So when equities were declining, which they were for a lot of that time, the gilt market was doing exactly what you wanted it to do and was a good diversifier. But since 2013 the relationship has not been consistent. In the last two months, the correlation has been negative as gilt yields rose as the equity market recovered in April and May. Gilt yields then fell sharply as Italy and trade wars came onto the front pages at the end of May. But the last two months do not alter the observation that since 2013 the relationship has been unstable. In fact for most of the last two years equities and gilts have spent more time positively correlated than they have negatively correlated. So, our conclusion from this is that gilts are no longer a reliable diversifier for a UK based investor. While we remain constructive on the outlook for global equities, we are sceptical that bonds will offer a high return in coming years. This could make the return from owning a 60/40 portfolio of equities and government bonds lower than it has been in recent decades. We also suspect that the 60/40 portfolio will be more volatile than it has been given that the bond and equity markets have become more positively correlated in recent years and we suspect that too will continue. This poses a challenge to our industry and to our clients. Our solution involves looking at different assets for both returns and diversification. Our next report in this series will explore the virtues of these Alternative Investments in more detail.